It has been a while…I suffered an injury to my left middle finger. You wouldn’t believe how much you use this finger…it is used quite a bit in addition to the friendly gesture. Somehow I came down on the finger right at the edge of the nail with a hammer while nailing in the back apron. There was a lot of blood, and then it became infected and pretty much useless. I have injured myself with hand tools in the past 4-5 months more than in all the years of working with machines. Perhaps I am forgetting about safety because I am not working with machines. I am learning at an accelerated rate that this is not the case. With hand tools you work close to the working edge of the tools most of the time. I need to take more care. 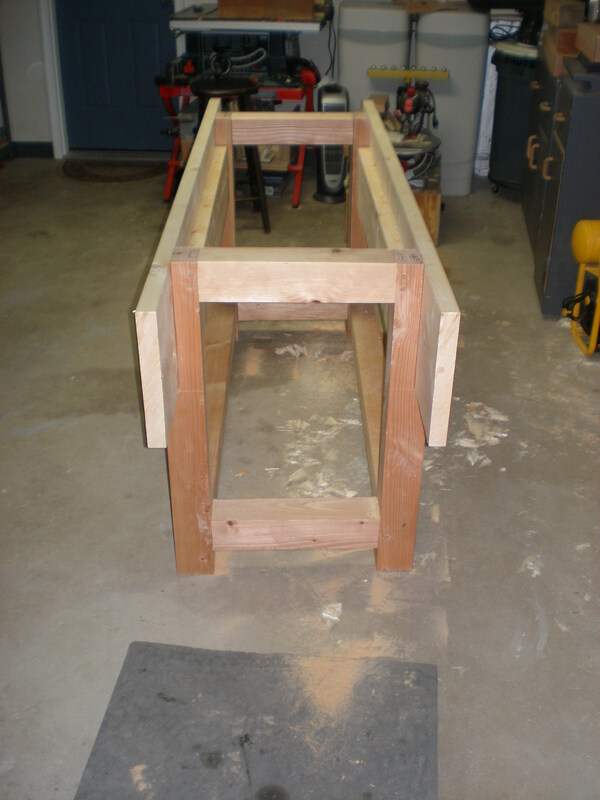 I cut the tenons for the front and back lower stretchers the same as the sides…except I had to be a little creative. 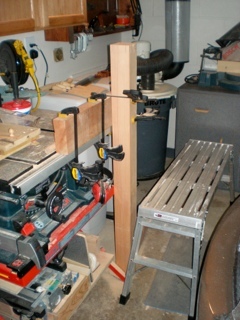 In the photo you can see my setup… my table saw is coming in handy…it makes a nice joinery bench. Clamping the stretchers in this way were a little too high for me to saw. I resorted to standing on a cut-off of one of the legs, which raised me a few inches off the ground giving me the height I needed. After cutting the tenons, I marked out the mortises and cut them the same as I did for the side assemblies. I did a test fit and everything looked good, so I moved onto drawboring the joints. I drawbored one of the assemblies to both stretchers and everything closed up nicely…and I was careful this time not to blast the peg through the other side of the leg. Then when I tried to fit the other end of the stretchers into the other side assembly, disaster hit again. The stretcher totally didn’t line up with the mortise as it had in dry fit assembly. Apparently the drawbore at the other end had pulled the joint from where I hoped it would go. My solution was to try to force it back into place…well that didn’t work. I heard that not-so-wonderful sound of wood cracking again. However, at this point I didn’t care, and I went on to drawbore the other side. There still is a big crack in the leg, but because I drawbored everything, the base of the bench is solid…nothing is loose or moving in any direction. It’s a testament to just how strong the drawbore joint is. I did decide though that this would be the back of the bench that will sit against the wall where it won’t be seen. Next I prepared the back apron, cutting it to final length and planing all sides and edges flat and square. I then measured and cut the back supporting piece for the apron and flattened only the side that would attach to the apron. I don’t care about the side that faces the inside of the bench as it won’t be seen. I was most concerned about the side that is to attach to the back of the apron to make sure I had good contact between the two pieces. 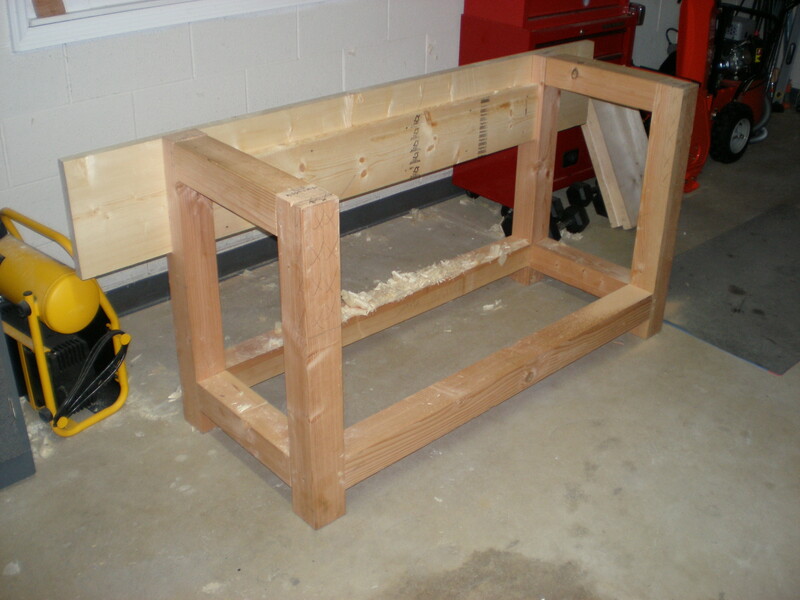 Then I assembled the two pieces together using cut nails that I purchased from Tools for Working Wood. This was the first time I have ever used cut nails. It really isn’t any different, except you have to orient the nail in the direction of the grain. I wanted to try these to see what all the hype was about, and apparently they have more holding power. Time will tell…I didn’t use any glue. The hardest part of the assembly of the aprons to the bench was cutting the large half lap joint. I’m sawing down the length of the grain with a cross-cut saw that most likely needs sharpening…not too mention the leg is 3 1/2″ wide. I literally was sawing for 40 minutes to complete both half laps for the back apron. I ended up in my T-shirt…and it was 45 degrees that night in the shop. I then cleaned up and made some adjustments on the half lap with a wide chisel. Then I nailed the apron to the legs with the cut nails. I repeated the same process for the front apron…with a couple of changes. First, I broke down and purchased a Pax 26″ rip saw to cut the half laps. Using the right tool for the job cannot be overstated. I cut both of these in about five minutes. That’s a huge difference compared to the 40 minutes I spent on the back apron. The second change I made was the placement of the cut nails. Before I started nailing the back support to the apron and the apron to the front legs, I drew some lines where my holdfast holes would be. After much thinking and erasing pencil lines, I decided to put the vertical lines 12″ apart. Then I connected those lines at an angle bottom to top from left to right. I transferred these lines around to the back of the apron and marked where I should drive the nails, so as not to interfere with the holdfast holes. Now she stands in her place, waiting for her top and shelf to be installed. First I have to install two support braces between the two aprons, and then plane everything level and into the same plane. I made sure to level the two aprons to each other, so all I would have to do is plane away the leg assemblies between them. 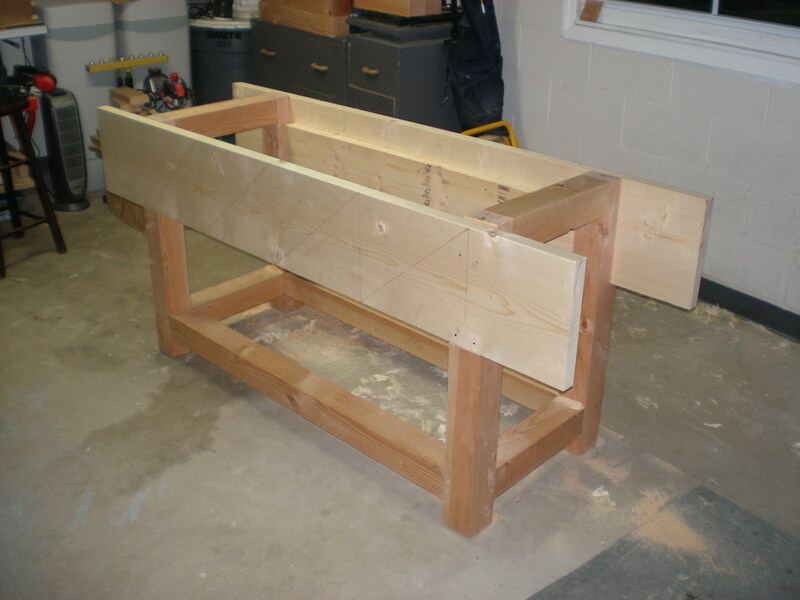 This entry was posted in hand tools, VCF, woodworking, workbench and tagged hand tools, woodworking, workbench, workshop by villagecustomfurniture. Bookmark the permalink. Poor finger! OUCH! It’s coming along fine. Can’t wait until I can see it in person, when the weather turns warmer! Looks great! Opps! I meant the workbench is coming along fine and looks great!